When you think of Punjab you immediately conjure an image of big brave fun loving people. Colourful dresses, Bhangra, Paneer, Butter Chicken, Patiala Peg and the Brave Sikh soldier are instantaneous connections. The food bowl of India nestled between the fertile valleys of the 5 rivers has been the first line of defence against the country’s invaders.Punjab is unique and ever since my 1st visit to Amritsar 4 years back I have been wanting to take the family to experience the essence of Panjibayat. We had 4 days to experience the charm of Punjab. We spent two days in Amritsar and 2 days at a rustic and sylvan farm stay called Punjabiyat – about 90 km north of Amritsar. If you want to experience the charm of this wonderful state – I urge you to follow this program. The Golden Temple is India’s most well managed and clean temple. It caters to large crowds especially on the weekends and festival days. Its serene, calm and beautiful inspite of the crowds. Plan a visit in the morning and in the night when it is lit up and don’t forgot to offer your services and eat a meal at the Langar. It’s a miracle how they serve so many people. The area around the temple has been done up like a walking heritage corridor – The cobbled pathways are broad, clean, well maintained with shops selling food, trinkets, and clothes on both sides. There are many hotels also walking distance from the temple. The locals recommend a place called Saragarhi Niwas (www.sgpcsarai.com) – Room rent Rs 1100/- a day. email sgpcsarai@gmail.com, Phone – 0183 – 2550060 which is located less than 100 m from the Golden Temple in the heritage corridor. Jalianwala Bagh is located right next to the Golden temple. Sadly the current state of maintenance does not do justice to the history it narrates. The Attari Wagah border is 30 Km from Amritsar, a 45-minute drive. Every evening there is a flag retreat ceremony that is jointly coordinated by the BSF and Pakistan Rangers at around 530 PM (Time varies by season). This half an hour show attended by nearly 10,000 people can be an adrenaline boost to your nationalistic spirit. It’s a must watch for every patriot and its FREE. To get front row tickets you need a VIP pass from someone in the BSF / Army which we were lucky to get. Even without a pass you can get a decent viewing spot from the gallery that is built like a stadium. And you can wrap up your Amritsar stay by shopping for Ladies Suits, Masala, Papad, Vadiyan, Sweets, Bangles…. Almost all the shops can stitch your dresses in 24 hrs and have them delivered at your hotel. In the two days you spend here you will also have time to visit the ancient Durgani temple (Under renovation) and the Mehramgarh Fort. Most people also spend an evening at Sada Pind – which is like a the Choki Dani of Jaipur creating a rural feel. From Amritsar we headed to Punjabiyat – a Rustic Rural Resort which is in Gurdaspur Dist north of Amritsar. A great place to experience the essence of real Punjab. It’s a short 90 min drive from Amritsar (excellent Roads) and is located in the midst of a vast expanse of agricultural fields. We visited on April 10 and the fields were laden with the Golden produce of wheat – ready for harvest after Baisakhi in a week’s time. The weather was pleasant even in April. This is fertile land close to the Beas river and they grow Wheat, Rice, Sarson and Sugarcane. If you come in Dec you can see the Sarson in full bloom- and that will indeed be a pretty sight. It does get cold in Dec but that adds to the charm of the holiday. Panjabiyat is Rustic Luxury. Its small, exclusive and efficient. There are 4 well-appointed cottages. Each Cottage has a large room, a very large airy bathroom, a nice sunny balcony facing the fields and a terrace that is accessible. The ceiling height is about 15 feet and the rooms are bright and happy. The furniture is all you need and more – solid wood. Room is large and can easily accommodate 3 adults – or 2 Adults + 2 Children. The walls, the furniture, the look and feel are rustic, warm and welcoming. The hospitality & service is excellent and food is custom made. We loved the food – it was fresh, hot and delicious with lots of variety. 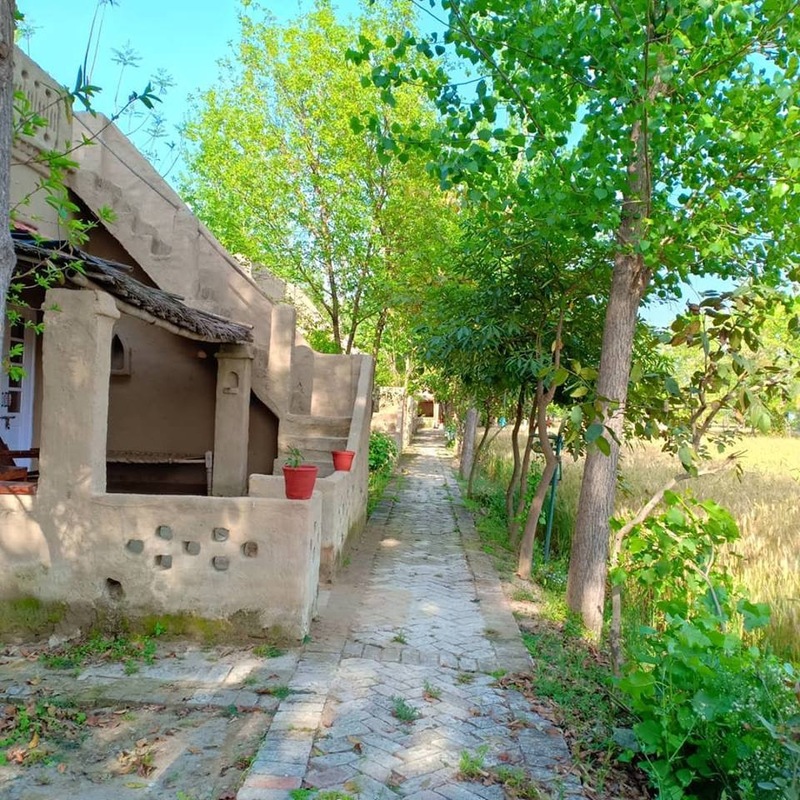 It is a small property with a common hall and a portico where they serve meals and you can get together with your friends for a drink, play carom or listen to music. They also have a small Library tower where they can set up a romantic breakfast. This is a great place for you to come with 2 – 3 family friends. Ideally book the whole place for 2 days and enjoy the solitude, the food, the ambience and the warmth of the place. Do take time to step out and visit the neighbourhood and some historic Gurudwara’s all of which are accessible by walk along the fields or by a tractor ride. A walk thru the fields can bring memories of William Wordsworths “A Solitary Reaper’. Kids may be fascinated with the milking of cows – but what really excited us was seeing how jaggery was made out of Sugar Cane. A family of 4 in very humble surrounding were working hard to crush the juice and process it across boiling vats to make fresh tasty Jaggery. Freshly made Jaggery tastes like Mysore Pak – it is warm and delicious. We also visited a rice mill and saw mountains of sparkling rice being separated from the chafe by automated machinery. To enjoy Panjabiyat you must love nature and solitude. It’s perfect for a 2-day break. Don’t expect too many thrills and action. There is no TV and the 3G signal is weak. Which is good because you get family time. Go for long walks. Take a ride in a tractor. Punjabiyat is a great place to Detox. Be with nature. Smell the earth. Listen to the birds. Use the time to read and meditate. Or just sit quietly by the Beas river and ponder and reflect on life and thank the good Lord for all his blessings and Grace. Come alone, come as a couple or just use this time to connect with family and friends. Punjabiyat is definitely an offbeat property worth visiting. Taxi : For the entire trip you can contact Mr Pandey. He is an ex BSF Commando and if you book your trip with him he can even help you with passes for the Attari Wagah border program. He can be reached at +91 9463521098. Even though we had passes from my Army friend he helped us in getting better seats using his BSF clout.